I actually look at most rainy days with a sigh of relief, especially today’s since it’s been dry for a whole week. It means that I have a day off from watering. (In the same way that I’m one of the last hold outs in the lawn mowing department, I also drag a hose and sprinkler all over the yard. That’s a whole other post.) So I bring all the flower pots out from any sheltered areas and let them soak up the moisture, because a good rain is much more quenching than my Gunga Din efforts. It also means that I can breathe a little easier. This has been a rough allergy season, and there’s nothing like some rain to clean the pollen out of the air — not to mention the rinsing off of the lawn furniture and the car. I also don’t like to work in the rain. Walk in the rain, yes. Work in the rain, no. While the rain might throw my yard work schedule off, even gardeners need a day inside to watch an old movie, finish reading Atlas Shrugged, and cook an amazing pot roast. But when I’m settled in to enjoy my rainy day, I see those peonies. Joe and I both love them — for the color, the size of the bloom, the variety. I look forward to seeing them each year, which is why I cringe when it rains. Rain can be a peony’s worst enemy. It’s like the big build-up for Christmas to arrive, and then BOOM — it’s December 26. All kids would like Christmas (or whichever holiday or happy event you celebrate) to be every day. And I’m sure most gardeners would love for every day to be peony day. Whatever. When it comes to my peonies, my only wish is that for every drop of rain that falls, that they can stand tall and weather the storm. Wow! I loved this post. First of yours I read, after googling “garden blogs.” I live in Lexington Ky and have discovered a green thumb growing from inside me. That sounded weird but whatever! 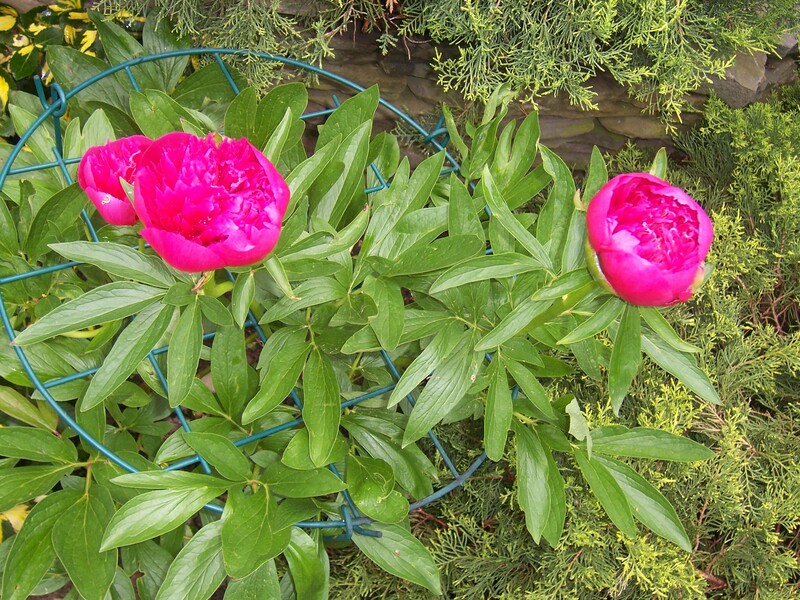 Anyway I just planted a peony in my backyard last week. And the sentiment about their petals falling like wet tissue paper is felt here also. 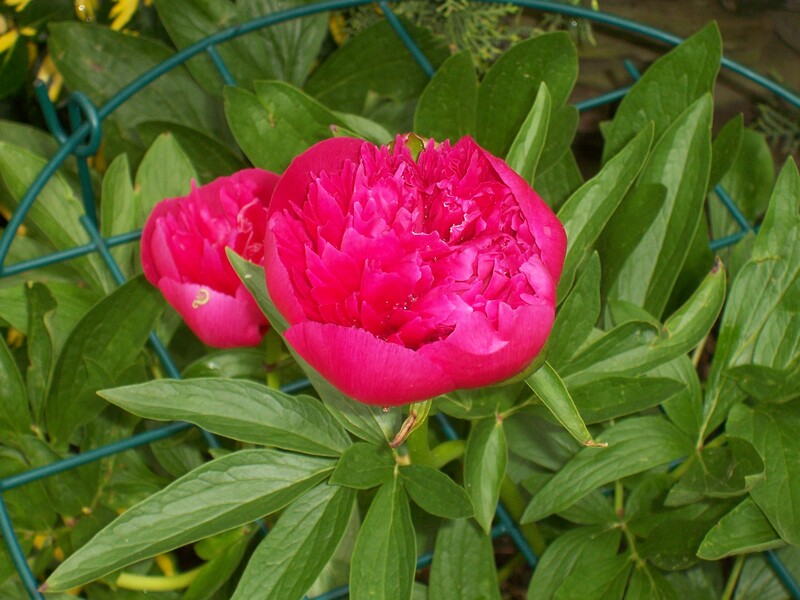 However, since my peony only had one bloom, being a baby, I knew it wouldn’t last long, but I am confident she will surprise me with many more in the weeks and years to come. Hey, thanks for commenting. Have faith in peonies. Even with rain, they’re troopers and they’ll return in years to come! I can resonate with this post. I love rain because after it passes, the whole world seems cleansed. On the other hand, I hate rain when I have to get somewhere and I have to take public commute. I end up literally looking like a cat dragged out of the rain. Most of all I kinda resent the rain when it sends all those delicate petals strewn across the yard or onto the pond’ surface. Welcome to the blog! Rain is, I guess, a necessary evil — as long as it’s delivered in moderation. Too much of a good thing, you know? Hope you stay dry. Hey,Kev, I feel your pain on the peony front. Mine began popping open last weekend, and yesterday there was nothing left of them. They are a ballerina pink, salad plate size, and they provide a week of smiles. However, there were no smiles this week, and I’m left with foliage and the image of another year passing ’til we see them again. By the way, the color of your plants is gorgeous: so vibrant and strong! I’ll live vicariously through you! The rain really smashed this particular peony, and it’s already droopy and fading fast. The good news is that I have a few more plants ready to open — I just don’t want to even consider the weather.